The two prevalent numbers for the middle class are net worth and credit score. These numbers are, however, not very useful if you wish to retire very early. Credit score measures your ability to take on debt and be obligated to work for others, and net worth says very little about how well your money is actually working for you. For instance, I did not start a credit history until 2006 and I did not start a tax-advantaged retirement plan until 2007. Both happened after I got financially independent. To properly evaluate an early retirement approach e.g. an approach that does not involve 30 years of working and paying off bills, other numbers must be optimized. The first number is the savings power. Here x is your savings rate. For standardization, it is easiest if x is your after-tax rate. The lower Y is, the better. Numbers below 15 are pretty good. Extreme numbers are single digit. A high savings power eventually establishes a high current ratio. Therefore you must first focus on increasing savings power. The second number is current ratio. Current assets are the liquidation value of all your assets. It is the value of your cash + the market value of your securities + the market value of your retirement plans (minus early withdrawal penalty) + anything else you will be able to sell within a year. Current liabilities are any kind of expenses you will incur within the next year such as cost of living, debt repayment, interest payments, and so on. If you have a double digit Current Ratio you are on your way to early retirement. If you are still in the single digits, you are still looking to work for at a decade or more. Early retirement becomes a possibility once the current ratio exceeds 25. The third and last number is cash flow. Cash flow becomes important once the current ratio is satisfied. Fortunately, there are many financial instruments that can easily be used to generate cash. Dividend yielding stocks is my favorite, but stock liquidation is also a possibility. Another possibility is REITs or simply owning land directly. It may be wise to start setting up your cash flow some time prior to early retirement, both to get a proof of concept, but also to avoid discontinuously rearranging your assets which would result in capital gains taxes, etc. 17 users responded in " How well are you doing on your way to early retirement? " But you say numbers that are lower than 15 are good? It seems like as savings rate increases, so does Y. What am I missing? I don’t think I understand these numbers. Does savings rate equal savings amount divided by earnings? So if I save $500 out of $2500 (after taxes) each month, then my x = .2? And if so, my Y would be 5/.8 = 6.25? That sounds much more extreme than I expected. Especially since I will be working 30 years before I retire. Second, what if my current liabilities are zero? Then the second equation means nothing. I liked your net worth divided by expenses ratio better. I agree that these are pretty misleading, especially the second equation. Right now my current ratio is 3, but in 4 years it will likely be “infinity.” It actually will probably go down before it goes up, even though I’m getting closer to the goal. The 1st equation basically means you should be saving 30-40% of your after tax salary, which I am doing. I don’t understand. My savings rate is 70% of my after tax money, yet that yields a y of 58.3 much higher than the above comment, even though she saves 20%. Huh??? ARGH – I messed up. It’s corrected now. This only works for high values of x. For complete formulae, we need to use PV and FV equations. These reduce to the above for an interest rate of 0%. How do you guys get your current liabilities to go to zero? Do you have zero expenses? If so I’d very much like to know how you do that?! I think “Current Liabilities” is misleading and implies total debt, and hence could yield infinity. “Yearly Expenses” would be more accurate. Basically you are saying that retirement becomes possible with a 4% and lower withdrawal rate. Savings power is a bit more abstract, but it is the total number of years of savings for retirement required if you earn 0% interest. Increasing your savings rate helps you by reducing the total amount you need to save (expressed in the numerator) and by saving in larger chunks (expressed in the denominator). The numbers are scary for a typical savings rate of 10%. 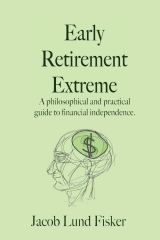 Extreme early retirement doesn’t rely on compound interest, but by reducing expenses. @seafire – I think you are right wrt eq. 2. Technically expenses are not liabilities. I have just trained myself to seem them that way. I used 4% just to have some reasonable scaling in the equations. I have seen people base their early retirement on 10+% returns. That is a wee bit too high. If I do a version 2 of this post, I’ll be sure to implement your suggestions. It is actually scary to see that many people basing their retirement on compound interest (I find it particularly frightening that they refer to it as magic implying that they don’t have a natural feel for exponential functions, like at all). If we introduce inflation and make the investment period “unlucky” (but not unusual), like say 1963 to 1979, (or 1998-2008) market returns would be zero. Introducing inflation, there are more periods with essentially zero return. I think people ought to stop assuming that “other people” will do the work for them (even though it is nice). I just found your site and am enjoying reading your posts. One comment about credit score – I used to say that it had no value to me, as I don’t intend to take on any new debt. However, in the past couple of years, I’ve seen that it is being used as part of the formula for calculating insurance premiums. Fortunately, my score is good, but I still thought that was rather sneaky. @retiredat47 – thanks for the heads up! I started a credit history about two years ago, because I figured … why not! (And I was getting of documenting my existence with photocopies of SSN cards, etc. for everything). According to http://www.bankrate.com/brm/fico/calc.asp my score is currently between 715 and 765. I have no idea how accurate that is as I am not paying $20 to get a “real” score. If there is anyone reading this who actually know their score, maybe they can double check the accuracy of the link above. Creditkarma.com also gives you a free score if you subject yourself to some marketing offers (similar to how Mint.com makes money). It is pretty accurate in my experience. The range reported by the bankrate.com link above contains the score creditkarma.com gives me. I am a little confused – how is Savings Power related to the other formula? And for example if I save 80% I could substitute such Y = 25(1 – 0.8) / 0.8 = 6.25 (correct? )… now what? How close am I to early retirement with that? This savings power function is nice but it needs a lot of explanation. Where do you get the 25 from? I might have a savings rate of 50% but I think there’s a lot more to this equation than you are explaining here and you have no references to any justification. Not to be rude, but to the newcomer, this looks like you pulled some numbers our of thin air (to be polite) and I have nothing to rely on to understand the validity of your statements. I am not one to go on blind faith. @Tom – The 25 is the inverse of the standard 4% withdrawal rate. The equation then gives the number of years it takes (without interest) to reach financial independence with a 4% withdrawal rate. This is close but I think there’s an additional consideration in your numbers. When we use the After Tax income to calculate the savings power and cash flow based on the 4% withdrawal rate you are by-passing the 15-18% net taxable income that needs to be considered for anyone who has an income greater than the taxable minimum. This is a footnote, but if you are checking your assets to liabilities to get a ~25 ratio, you have to factor in the taxes or you’ll end up ~15-17% off.